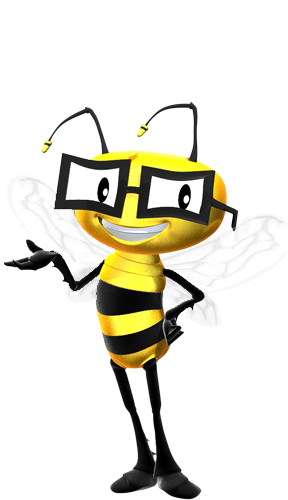 There could be no better spokesman for eating fruits and veggies than Vitamin Bee. A fun, informative and energetic character that gets our audience excited about including nutritious foods into their lives. After all, without the honey bee, we wouldn’t have all this great food! Vitamin Bee represents a collection of individuals who believe learning about nutritious foods and creating healthy habits are just as essential to young growing minds and bodies as learning the “ABC’s and 123’s”. Our creative family and valued contributors include individuals who have experience with promoting education through television media, a registered dietitian with a Master’s in Public Health, and perhaps more importantly, health conscious parents and their young consumers. It is a well-known fact that people, especially kids, learn more when they are having fun. So Vitamin Bee delivers huge doses of fun and much more with his curious facts about foods and the life of a bee, kid-friendly recipes and tips, all wrapped up in his love of music, art, and silly antics, that will inspire kids to make healthy choices, one episode at a time. Vitamin Bee also encourages kids, families, and schools to learn and work together in order to build the support needed to create a long-lasting healthy environment.